5 | 223 students enrolled. Certification in Online Equity Valuation and Financial Modeling course is jointly certified by NSE Academy & Elearnmarkets (NSE Academy is a subsidiary of National Stock Exchange of India). Financial Modeling has begun to emerge as a crucial tool in today's data driven world, where most decisions are greatly quantitative based. It has become the most wanted skill, which is required in almost all the components of the financial services industry, such as, banking, equity research. Certification in Online Equity Valuation and Financial Modeling is a perfectly designed course which aims to provide practical exposure to individuals who believe in long term investment and value creation. This programme is developed in such a way so as to help the participants not only to understand the very nature of the subject but also to apply this knowledge in developing realistic and consistent financial models for real life problems. Certification in Online Equity Valuation and Financial Modeling course aims to offer the participants the comprehensive instructions and training required to compete successfully in swiftly developing financial markets. This programme will enable the students to develop comprehensive knowledge on both fundamental theories as well as practices of various aspects of financial modeling such as: valuation analysis, strategic analysis, DCF modeling, etc. The course will teach the participants via modeling through excel to create their own financial models right from scratch. Participants will also be given access to related webinars conducted by Kredent Academy for further knowledge enhancement. An email query support, Question & Answer community platform can be used by the students for any type of doubt clearance associated with content while pursuing this course. Any working professional looking to improve their job prospects in the Equity Research field. Internship- Practical internship of 10 hours available for the students at an additional fee of INR 5,000 + 18% GST. 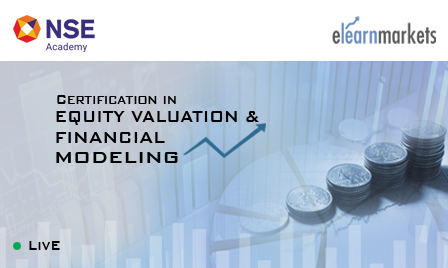 Under this course “Certification in Online Equity Valuation and Financial Modeling”, the participant will be required to appear for the online examination hosted on the website of Elearnmarkets.com. Please note that the participant will get the Certificate of Completion of Certification in Online Equity Valuation and Financial Modeling after successfully clearing the online examination. After successful completion the online examinations, participants can download their certificate from "My Certificates" tab available on Elearnmarkets dashboard within 10 days from the date of Certificate.